I hope a title like this has gained everyone’s attention! I have been in South Africa for nearly a month now, and I won’t get to bogged down in all the details, but so far the experience has been fantastic and rewarding in nearly every way! I admit, this title is a play on words. In my time here so far I must say I have seen none of “the big five” (lion, elephant, Cape buffalo, Black/White rhino and leopard), the large animals which make this country such a Mecca for eco-tourism and conservation. Although my nocturnal hunt was not for any of the above named animals, my target species are incredible for a number of reasons. For example, none of the above named big five can change their skin colour within seconds, move their eyes independently of each other in a fascinating ball and socket joint fashion, allowing them look behind and ahead at the same time, or catch their prey using their tongue like a sticky quick-ejecting whip! 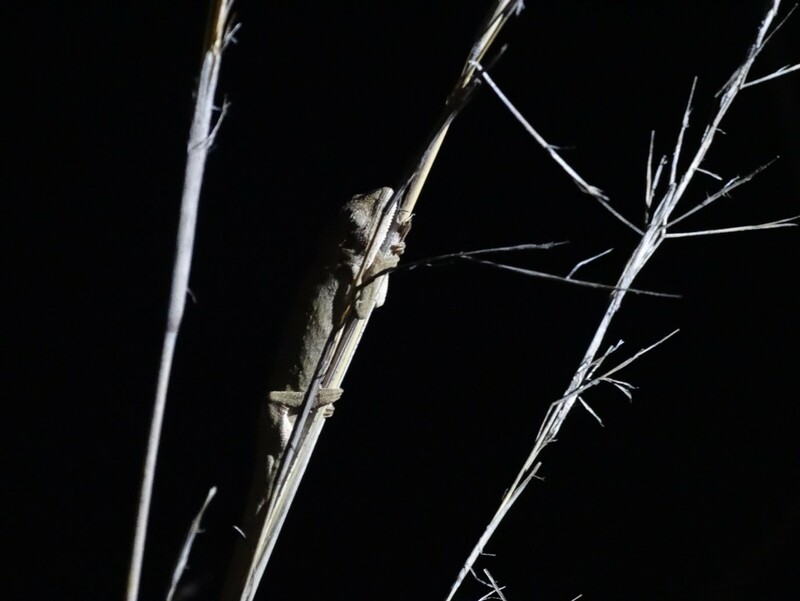 Yes, that’s right, my nocturnal hunt was a hunt for two species of chameleon. The title derives from the Greek translation of the word chameleon which literally means “lion of the ground”. Chameleons truly are fascinating animals. I find for those even who normally (and wrongly) regard reptiles as “evil” and “slimy” they too even have a soft spot for chameleons, purely for their “uniqueness” as above mentioned. In total there are eight genera and 162 species of chameleon known globally, of that number three genera and 19 species occur in southern Africa (southern Africa refers to the countries bordering South Africa also, like Lesotho Mozambique, Botswana and Zimbabwe etc.). My academic supervisor here in South Africa (Professor Downs) has encouraged me to join on field work involving reptiles of all kinds! So it was up to me, like all young zoologists, to be brave, to network and mingle, and to let everyone know your interests in the hopes of finding that all too precious field work experience! Not so long ago I joined another researcher here to visit her field site. 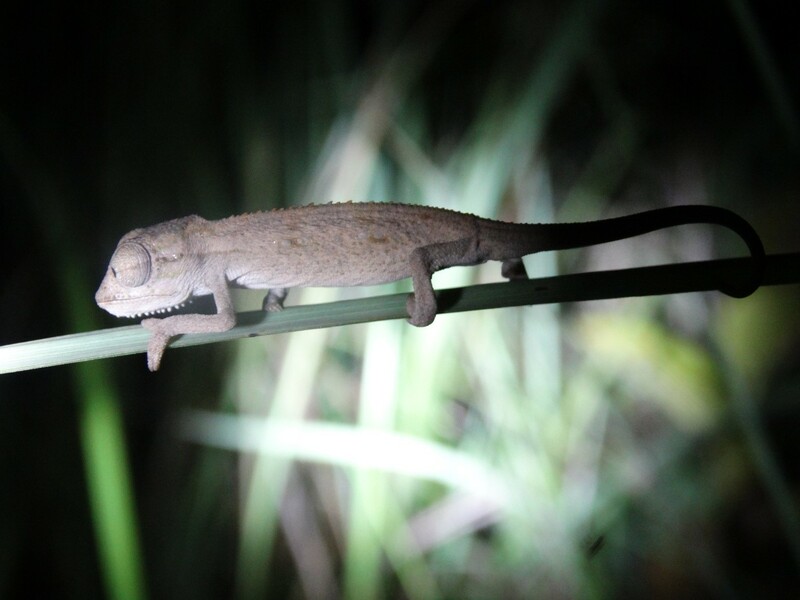 I ended up in a conversation with the manager of the site and he mentioned in passing that one of South Africa’s top herpetologists (Dr Tolley) would be conducting a week of nocturnal chameleon surveys shortly; this was clearly music to my ears! I got in contact with Dr Tolley who was extremely welcoming and approachable and was happy I showed an interested and was very happy I joined her and her researchers one evening for a survey. Setting out from Pietermaritzburg with three colleagues from the university the weather did not look promising. It was heavy rain but atleast it was still a warm 24 degrees, a luxury I know we can’t relate to back home most of the time! Luckily as we approached the survey site (just outside of Westville) the rain disappeared. On arrival, and after a light hearted and informal introduction to everyone, Dr Tolley explained the aim and method of the evening. 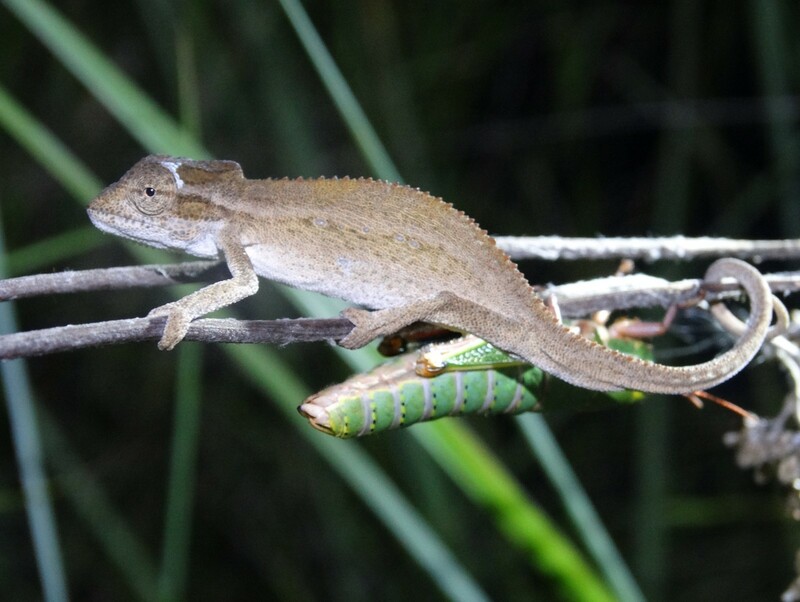 Colleagues from Israel, who were in attendance, had studied in great detail the European chameleon (Chamaeleo chamaeleon) and believed the most similar species was the KwaZulu (KZ) dwarf chameleon (Bradypodion melanocephalum) but the KZ dwarf chameleon is very understudied and little is known about its behaviour or habitat preferences in comparison. What is known is that it is rare, and unfortunately getting rarer as within its natural range it is only being recorded in isolated protected pockets and is increasingly in danger of further human encroachment. So the aim of the evening was to collect 10 specimens of the KZ dwarf, GPS mark the exact points of collection and work with the 10 individuals the next day to try begin to understand their colour signalling behaviour. The other chameleon species present and regularly encountered was the flap-necked chameleon. This species was not collected though as it was not the target and is one of the most common and widespread species in South Africa. Even for someone who has only been in the country less than a month, it was a complete thrill to encounter them! The study site was not what I expected to be prime chameleon habitat. When I used to think chameleons I usually thought high humidity and dense thick forest growth with vines and mosses; rainforest basically. I now know that this type of habitat is only prime habitat for certain types of species. Our study site was more high grasses with thickets and pockets of small trees and bush. The earth was dry and almost sandy and there was a warm strong breeze. Not dissimilar to sand dune habitat back home in Ireland, on sites like Bull Island (see Collie Ennis’s previous article for surveying our native lizard on the Bull). 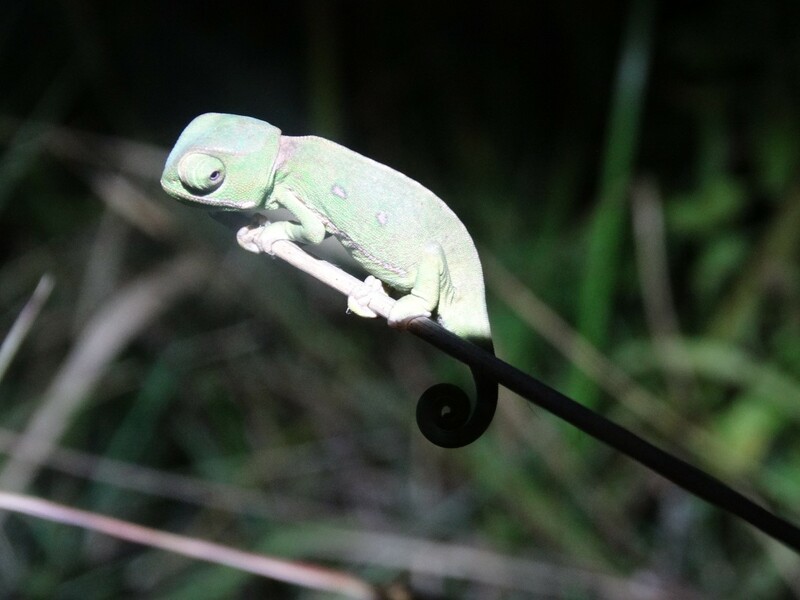 Oddly enough the first chameleon we encountered was an adult male of the rarer of the two present, the KZ dwarf. Here is probably the time I should also admit something else: although we found eleven KZ dwarfs in total, and many more flap-necked, my personal tally was zero. But in my defence they are extremely well camouflaged and only around the same size as a grasshopper (see pics) and Dr Tolley did tell me she has had many years experience doing this! So all of that made me feel slightly better, but chameleon spotting is definitely something I want to improve on and master over the next few years. When I seen the first KZ dwarf it truly was impressive how well camouflaged he was. He was flush to a stalk of dried grass and the exact same colour. His head was the only thing that was slightly distinctive. Interestingly when he was removed from his perch he immediately went almost black in colour and opened his mouth full gape to show a bright orange interior, a defensive display against anything considering eating him apparently. Our survey site was divided by a road. The side we began on Dr Tolley first explained a little over 2 years ago was destroyed by a fire and since the fire she had seen no chameleons of either species. Our first 2 KZ dwarfs were on that side and plenty of flap-neck chameleons! This was very encouraging to see in the flesh and goes to show that when given the chance to heal an areas wildlife can return. When we did cross to the other side of the road though it was obvious which had the fire damage; we found 9 further KZ dwarfs in just under 90 minutes bringing our total to 11 which was 1 over what was necessary, meaning the final specimen we found, a young female, was lucky enough to be left where she was, although all 10 individuals would be released in the exact locations they were found within 24hrs of capture. With our number reached it was time to return to the vehicles so as to not disturb the area anymore than was necessary after what was a very productive and exciting hunt. On a final note I would just like to thank Dr Tolley one more time for allowing us to participate in the survey and find out more about the wonderful and striking “ground lions”. I would also like to take this opportunity to quickly remind readers who are recent graduates, or thinking of starting a career in conservation science, one important thing. Dr Tolley was delighted to see our interest and passion and was happy we joined on this survey. I know that sometimes experts in their field or academics may appear to be daunting figures. Some may think that any questions they have will be considered dumb or simple question. I can safely say from my personal experience that is simple not the case. Experts in their field, or academics, love nothing more than to talk with people who share an interest in their area! Or people who may not even share the interest just yet and are curious, the experts love their field and want to persuade you to love it too. It is up to you though to make the connection and begin stating your curiosity and interest. Most experts and academics will be only too happy to help and encourage you. So be brave and network and speak with the experts in the area that interests you. Only positive things will come of it. I love the pictures in this. 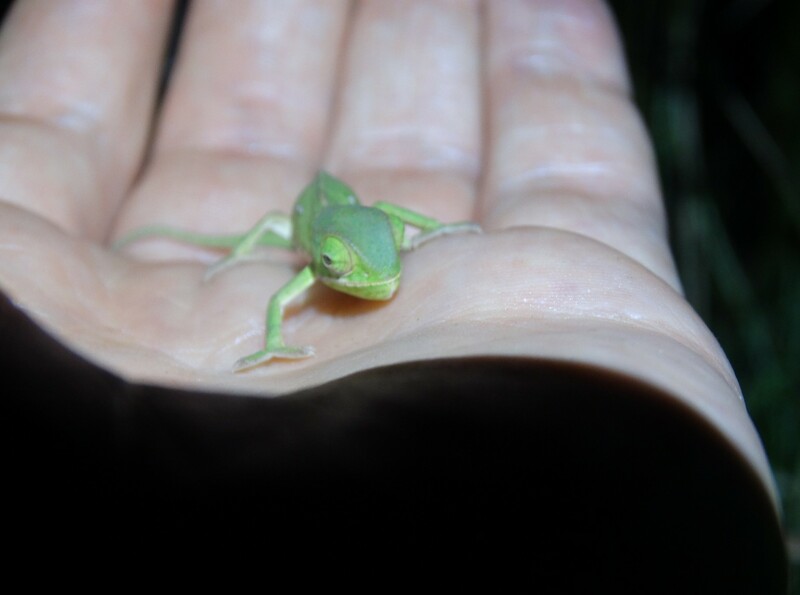 Especially the male KwaZulu dwarf chameleon with the grasshopper!